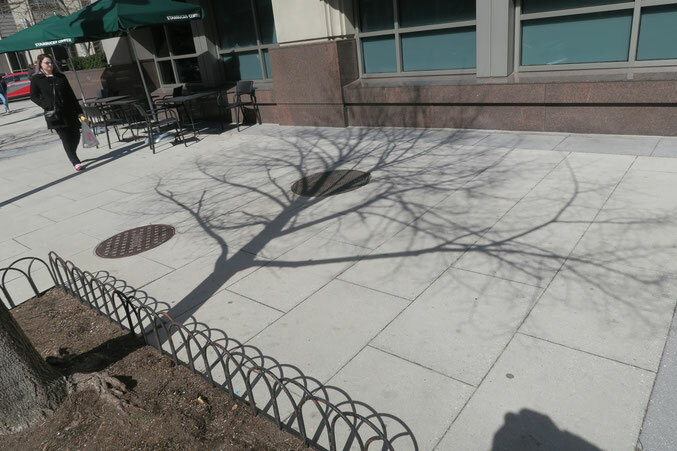 The location was in Washington DC in the City Center District. The "Take It!" came from being on the sidewalk and walking toward this wonderful shadow cast by a tree. The image got more clarity as I got closer to it. That it included several of my favorite things brought my attention to how I might best photograph the setting and not have the inclusion of my own shadow. One of the things I was brought up with, was the need to produce or whenever possible find perfection. As life has moved along I have fortunately been able to include and have a separate appreciation for the beauty which can be found in imperfections. I consider myself to be very lucky in having acquired this expanding sense of awe in the range of subjects affording the engaging of this set of views. The end of Winter is coming closer and with it, the covering of the inter structure of trees and many plants with foliage. While I welcome and cherish the loosing of many such wonderful samples of plant life, I treasure the winter season and the chance to see the "bones" of what brings about the shape of what is to come. Here is hoping you too have a similar happy experience of watching an underfoot shadow make itself known and you be able engage in an immersion in it. Best wishes from one who was in our Nation's Capital and out and about watching and being caught up in the amazing energy brought with those who came to call for the safety of children from guns. I listened in my car to the radio program which carried coverage of the event. Big changes are coming and I believe they will be rational and well thought out. * Within the hour this image was no longer available for viewing as it was covered with people of every description on their way to the Event put on for safety from guns for our Children. Is that your shadow in the bottom right? Wow end of March and the trees were still bare. It looks like that lady is trying to figure out what you were taking a picture of. This is a really cool photograph. Its funny how we walk by these things every single day and don't think twice about it yet somehow you capture them and its art.